โทร. 02-574-3355 และ 087-694-7559 น. 2. ส่งใบนัดตรวจทางโทรสารเพื่อนัดหมายได้ที่เบอร์ 02-574-4724 ทุกวัน เวลา 8.00-16.00 น. It is graciously founded on the aspirations and vision of Professor. Dr. HRH Princess Chulabhorn, with the set course of actions and supports towards international collaboration networks, such as The International Atomic Energy Agency (IAEA) as a center for diagnosis of cancer, neurological, and heart diseases through modern, advanced technology and the most cost-effectiveness of researches and knowledge transfer for the most quality of life and better health care among Thai people as a whole. Radiopharmaceutical products for service to various hospitals with PET/CT. It is the accelerator for the radioactive particles in the positron, including carbon (11C), nitrogen (13N), oxygen (15O), and fluorine (18F), which are elements in the natural compounds of body’s cells. Each of these radioactive substances is prepared as a radiopharmaceutical by labeling with compounds specific for cellular activity, such as Fluoro-deoxy-glucose or FDG, and required a strict quality control to inject in patients and measure radiation intensity of suspected lesions within the organs by PET/CT. National Cyclotron and PET Centre, Chulabhorn Hospital is the center for radiopharmaceuticals production from the cyclotron. 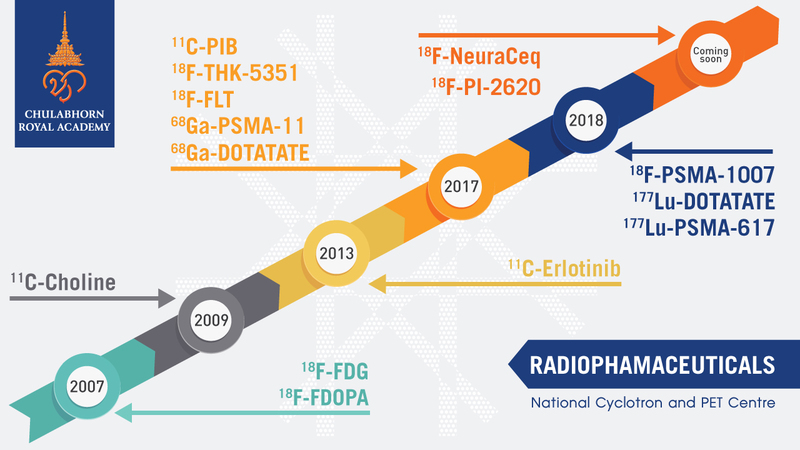 These radiopharmaceuticals are ordered and purchased by various hospitals with PET/CT. 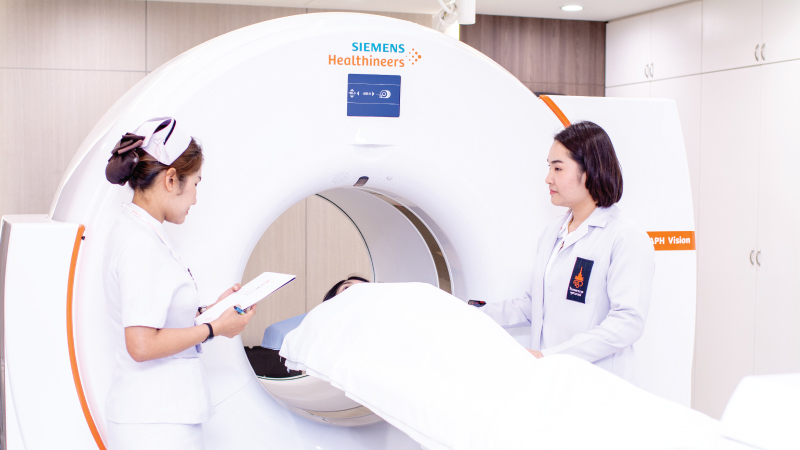 Also, PET/CT service is provided to patients with all types of health coverage and those transferred from other hospitals nationwide. The center commits and strives for continuous research and development in the production of radiopharmaceuticals. PET/CT is a nuclear medicine instrument of PET (Positron Emission Tomography) and CT (Computed Tomography), highly effective in detecting cancer, neurological and heart diseases. Current Cancer Detection There are many ways to detect the stage of cancer for the most appropriate treatment, including laboratory test, CT scan, magnetic resonance imaging (MRI), tissue biopsy and PET/CT. There are many ways to detect the stage of cancer for the most appropriate treatment, including laboratory test, CT scan, magnetic resonance imaging (MRI), tissue biopsy and PET/CT. How can PET-CT detect cancer? Before receiving PET/CT, patients are intravenously injected with radiopharmaceuticals of labeled radioactive in positron. PET/CT then measures the gamma rays of those uptake accumulated radiopharmaceuticals that come out from patients’ body cells. The cells with higher metabolic rate can be easily detected with higher gamma rays than other areas for cancer diagnosis. Can medical costs be reimbursed? The reimbursement of medical costs for government officers only covers the PET/CT under the clinical indications of the Comptroller General’s Department, including colorectal cancer and lung cancer. These two diseases are also indicative in further details with other diseases based on the affiliated offices. So, those eligible for the reimbursement of medical costs need to check with the affiliated hospitals regarding the coverage of PET/CT as indicative. 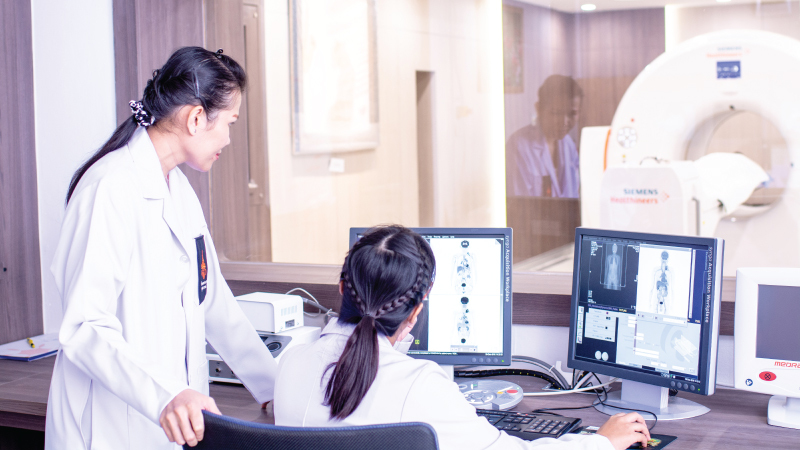 Providing diagnostic and pathological details that cannot be determined by other testing, such as computer tomography (CT) or magnetic resonance imaging (MRI). Yielding an accuracy of early stage cancer diagnosis. Staging of cancer correctly towards the most appropriate treatment plan for patients with lower costs and less complications from unnecessary treatments. Predicting the metastasis of cancer from a single whole-body examination. Detecting the remaining of cancer cells and recurrence after treatment. Giving accurate diagnosis in each staging of diseases towards the most appropriate treatments in each patient. Assessing response of diseases after various treatment modalities. Considering as safe for examination. What else can PET/CT perform other than cancer? Preoperative evaluation in patients with epilepsy. Diagnosis of Parkinson's disease and differentiation of Parkinson's disease from other diseases with similar symptoms. Identifying the severity of brain tumors and recurrence. Diagnosis of Alzheimer's disease at early stage with differentiated causes of Dementia. Analysis of circulatory system inside the heart. Assessment of myocardial cells’ viability. Evaluation and prediction of preoperative diseases. Identifying the scope of diseases for treatment, such as coronary artery bypass or neurological heart transplant.